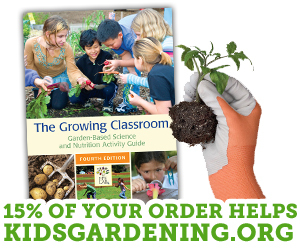 Structured raised bed gardens help school gardening programs thrive. Although they increase the initial investment of time and money, raised bed gardens are generally easier to maintain and allow young gardeners to spend more time learning in the garden, rather than struggling with challenges like difficult soil conditions and weeds. They also provide garden programs with a more permanent presence encouraging participants and administrators to view the garden as an important resource that should be used often and sustained over time. Raised bed gardens give you control over soil composition, allowing for better drainage and the opportunity to amend the soil as needed for optimum growth of plantings. They offer flexibility in location and can be installed over soil or paved surfaces. Generally, it is easier to control weeds and plant new seeds and seedlings in raised beds. The soil in raised beds warms faster in spring allowing for earlier planting dates and harvesting before the end of the school year. The elevated location of raised beds helps prevent soil compaction by decreasing foot traffic. When building raised beds, choose natural materials over those that have been treated with preservative chemicals. Click here to download a chart comparing the different types of materials commonly used to construct structured raised beds. If funding for structured raised beds is unavailable, temporary raised beds are an option. Temporary raised bed gardens can be created without containment structures by simply shoveling soil and adding compost so that the soil bed is raised at least a foot above ground level. Because the soil will erode over time, temporary raised beds will need to be rejuvenated annually. How much space do we have? Beds can be square, rectangular, round, triangular… or even a unique shape like a butterfly or star. The possibilities are endless, although not always practical. The desired size and shape will help you determine the best materials to use. What will we be growing? How much room will the plants’ roots need? Although some common vegetables like lettuce can grow in 6 inches of soil, most raised beds are between 8 and 12 inches deep. If you are planting over a paved surface, increase that depth to 18 to 24 inches. Conversely, if you are planting over decent soil, you can loosen the soil underneath the bed with a shovel or garden fork to give roots extra room to grow and then install a more shallow bed. What is the arm span of our gardeners? For most youth, you do not want the beds to be wider than 4 feet or they will need to step into the bed to plant and maintain it. For very young children, 2 to 3 feet wide may be more appropriate. Also keep in mind any special needs of your gardeners. Another benefit of structured raised bed gardens is that they can be designed to accommodate gardeners needing adaptations. Learn more about accessible gardens from the article Designing Garden Programs for All. There is a wide range in costs of materials to make raised bed structures. Wood is usually the least expensive option and brick or stone is usually the most expensive option. Attached you will find a comparison of different materials used to make raised bed structures. Is it possible that the beds will need to be moved? If future building or playground construction is a possibility, choose structures that are easier to relocate. There are many raised bed garden kits available for purchase if designing your own bed seems overwhelming. Most are very easy to construct and designed to be long lasting. You can also purchase raised bed garden corners and find wood or composite boards locally to reduce shipping costs. Avoided pressure-treated wood. Studies have suggested toxins may leach into the soil. Even if you plan to install non-edible plantings, you will want to keep your options open for future designs. Don’t spend all your money on the structure. Make sure to also invest in quality topsoil, garden soil and/or compost. Most plants will grow well in a 50/50 mixture of compost and topsoil. If planting over grass, begin by covering the bottom with a layer of newspapers to discourage the weeds and grass from growing into the bed. Mulch your beds to help decrease water loss and prevent weeds from growing. In drier areas, explore possibilities for installing irrigation to each bed.